Winter is coming, so it’s time to ask yourself if you have your urban garden ready for the cold? Below, you’ll find some helpful tips to help you prepare your garden for what’s to come in the winter months, and how to take care of yourself in the process. Do you just have a few tomato and basil plants on a balcony, or a big rooftop garden you’ve spent years cultivating and brag about to friends on Instagram? The size of your garden plays a significant role in how much you need to prepare and how early. Start planning just like you would with your Christmas list. Think big picture: track the plants you need to prune when, and make notes about their special care. If you are involved in a community garden, others might be able to help you edit – especially if you grow fruit or vegetables and are experiencing a bumper crop this season. With a rooftop garden, you can enlist the help of family and friends to take care of weeds, dead leaves, and pests. Small plants that you keep on a balcony are generally the easiest to take care of. Gardening is great for the mind and body, but there are still some considerations you need to make. Sun and wind exposure are two of the biggest challenges urban gardeners face because they are often growing their plants several stories above street level. Keeping this in mind as you prepare your plants for winter’s chill is a must. Consider whether you might need to invest in a sunshade or even bring some of your plants indoors. Having some green growth during the dead of winter is a great way to brighten up any apartment. Even if you find yourself spending a lot of time tending your plants, striking a balance is important. You might even have your kids take over some of the gardening responsibilities. It’s a great way to help them learn biology and could even turn into one of their favorite after-school projects! If your children are going to help you garden, though, making sure they have the right footwear helps. They can feel grownup wearing gardening boots just like Mom or Dad. Discover children’s boots in a wide variety of colors and designs, including fur-lined ones that are perfect for winter. Even in an urban landscape, how you dress to take care of your garden matters. That’s why you need a pair of boots than can keep you dry and comfortable while you work. If you want a boot that holds its own in the garden and when you walk down the street to the florist, consider a boot from Us.aigle-store.com where well-made, waterproof, seamlessly-designed boots are available in a plethora of styles. Transition from tending raised vegetable garden boxes to cocktails – yes, the right pair of boots can do that! Aigle boots are also made by hand in a tradition that has lasted over 150 years. These boots last longer and can hold up to all the rigors urban gardening demands. City dwellers don’t always have the time to completely change outfits before the next task. The go, go, go attitude of city life demands multi-functional footwear. 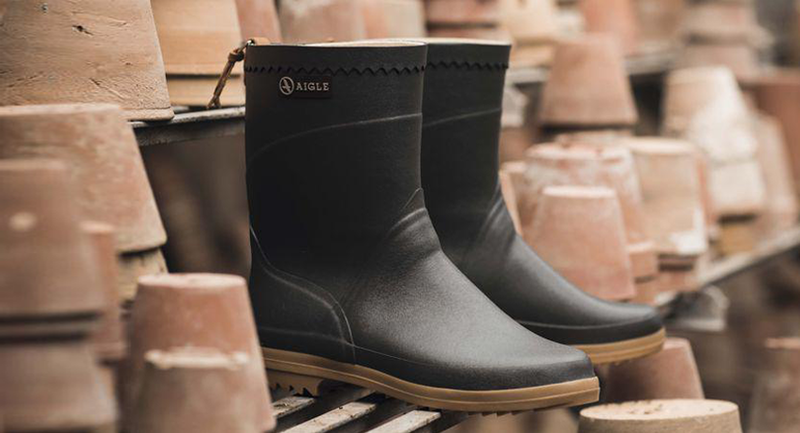 Aigle boots are perfect for city and country life, which is why this brand’s gardening boots for men and women have been a staple in gardening collections since the 1960s.